The UK-ASEAN Business Council hosted the ASEAN Secretary-General, H.E. Dato Lim Jock Hoi, to a breakfast briefing with invited guests from the UK’s corporate and government sectors and Members of Parliament. The Secretary-General was keen to listen to areas of interest in Southeast Asia and the discussion covered a broad range of issues. The Secretary-General invited UKABC to bring a delegation to visit the Secretariat in Jakarta. 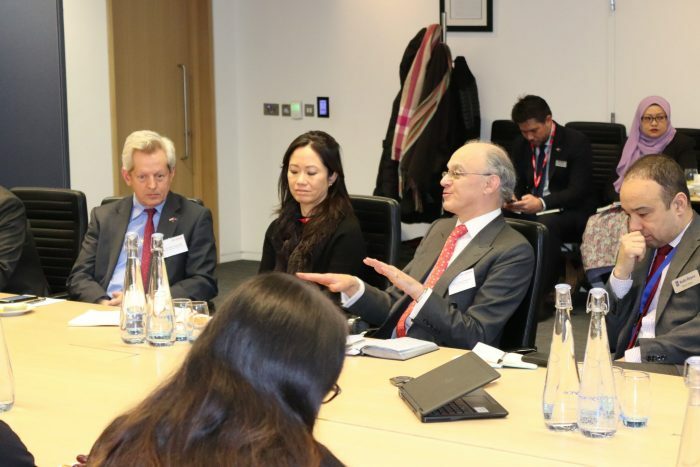 The discussion was held under the Chatham House rule and Rolls Royce kindly provided their meeting room for the Briefing. 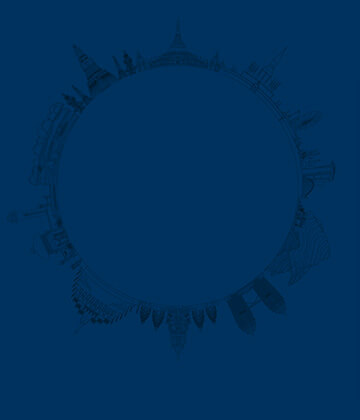 Sustainable development is very important in Southeast Asia. ASEAN share’s similar aims and objectives with the EU and the UK in terms of climate change and conservation. ASEAN wants to see more focus in the area of sustainable development especially in energy conservation and energy efficiency. On the Belt and Road Initiative, the Secretariat does not have a department specifically working on this and leaves individual countries to develop their own engagement strategies. The Secretariat does have an ASEAN Investment Fund, there is some left which is planned to be used on green investments for the future. ASEAN is a rules-based organisation and wants to see more engagement in FTA’s with dialogue partners and like-minded countries. ASEAN has an FTA with six of its dialogue partners namely Australia and New Zealand, China, India, Korea and Japan. It also has an FTA with Hong Kong. The ASEAN-EU FTA is being discussed. The Regional Comprehensive Economic Partnership (RCEP) is progressing and there should be significant announcements at the ASEAN Summit in November in Thailand. The Secretariat is excited, not just for ASEAN, but for all the participants. This will be a significant agreement that will include the 10 ASEAN Members States and the six dialogue partners which have an FTA with ASEAN. The secretariat is also working on upgrading existing bilateral FTAs with China, Korea, Australia and New Zealand. Some ASEAN FTA partners do not have an FTAs with each other which is making RCEP a challenge. The secretariat is in exploratory talks with Canada and Russia as part of the development of the ASEAN Economic Community. 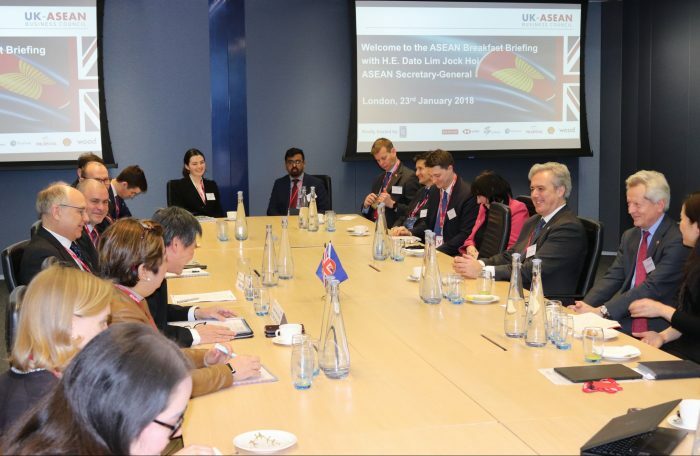 While the Secretariat welcomes the ASEAN Member States to pursue bilateral trade agreements, they would also like to see a UK-ASEAN trade agreement explored and developed. The Comprehensive Partnership for Transpacific Partnership is now in effect. The standard of the agreement is very high. Thailand, Indonesia and the Philippines have expressed an interest in joining and the Secretariat is supportive of their efforts to join. If countries join, they will open their markets further for investment by international investors. In terms of RCEP, there is a very robust investment chapter being negotiated. Within RCEP there are three CPTPP non-ASEAN countries (Australia, Japan, New Zealand) and four ASEAN countries (Brunei, Malaysia, Singapore, Vietnam) so there is pressure to bring RCEP closer to the standard of the CPTPP. 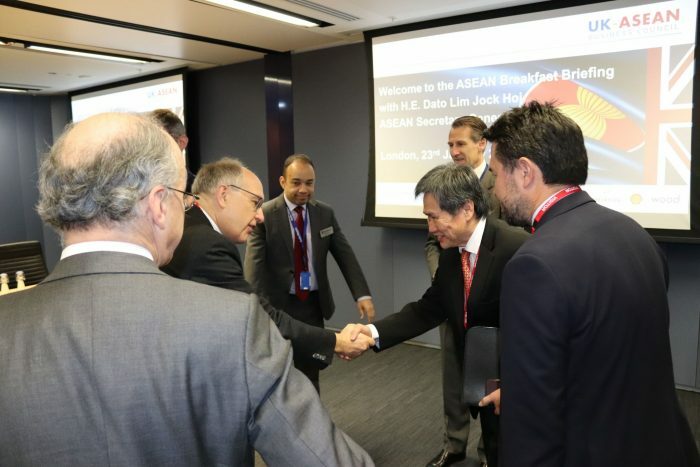 The ASEAN Secretary-General visited the National Cyber Security Centre to better understand the UK’s expertise in this field. 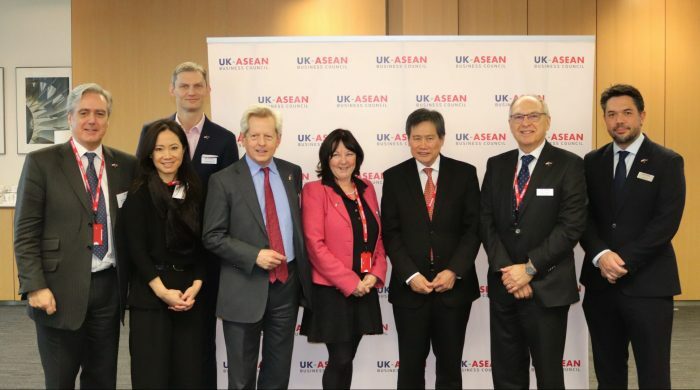 The potential for ASEAN’s digital economy is very significant and UK companies are encouraged to see how they can work together with ASEAN in this area. There are opportunities and challenges with the Fourth Industrial Revolution. ASEAN is highly conscious of disruption as well as the opportunities. The secretariat is conducting studies on the impact and how to address the gaps. Thailand hosted a large Fourth Industrial Revolution conference on the 14th of January. There is great emphasis on the importance of education with a focus on TVET. Science and technology and the right skills for the future are important. The Secretariat is keen to focus on a lot of issues related to education. ASEAN is working with GIZ of Germany on TVET and how to address the issue of the skills gap. For more info see here and for the press release on ASEAN TVET visit to Germany here. ASEAN has different levels of readiness to address the fourth industrial revolution. A whole of ASEAN approach to developing a comprehensive framework is needed. There has been a lot of activity with a great number of start-ups, especially in Singapore and Indonesia. The cashless way of life is growing, and smartphones are used everywhere. In China, even street vendors are using smartphones and not accepting cash and the Secretariat is learning from China on this. Improving standards across the region. Within ASEAN there is a disparity in the level of standards. ASEAN is trying to promote seamless trade. There are a committee and framework on quality standards and mutual recognition. It is important to have common standards and recognise each other’s standards and for it not to become a non-trade barrier issue. There is a monitoring division to try and identify areas to reduce the cost of doing business. The Secretariat works with the World Bank on the Ease of Doing Business rankings. It is very much on the agenda of ASEAN Ministers. There is a lot of focus on trade facilitation. The Secretariat is looking at addressing gaps with the help of development partners as the levels of readiness are very wide. The Secretariat is grateful to the development partners who are helping implement initiatives such as the ASEAN Single Window (mainly with the US). The aim is to have an ASEAN Single Window in each ASEAN Member State by the end of the year. The Secretariat believes that facilitation is the greatest way to reduce barriers and aims to reduce 10% of the cost of doing business within 5 years. The Secretariat has the ASEAN Qualifications Reference Framework (AQRF) that seeks to enable comparisons of education qualifications across participating ASEAN Member States (AMS). The secretariat is also working on Mutual Recognition Arrangements (MRAs) that would allow greater cross movement of skilled labour such as for doctors and engineers. It was noted that 60% of GDP in ASEAN is in services so standards and mutual recognition of those services are important for the region. Transparency is very important. The Secretariat wants the private sector to tell them what the non-tariff barriers are and what are the issues faced. The trade tension between the US and China will have an impact on everyone. ASEAN trade with China is the biggest with over US$500bn in trade. It impacts ASEAN as many ASEAN countries are part of the supply chain for either US or Chinese goods. Some may, however, benefit as companies look to relocate from China to Southeast Asia. The Secretariat would like to see less tension. The Secretariat is concerned with any protectionist measures undertaken and want to see more open economies in the world. They want to work with like-minded economies like the EU and the UK. 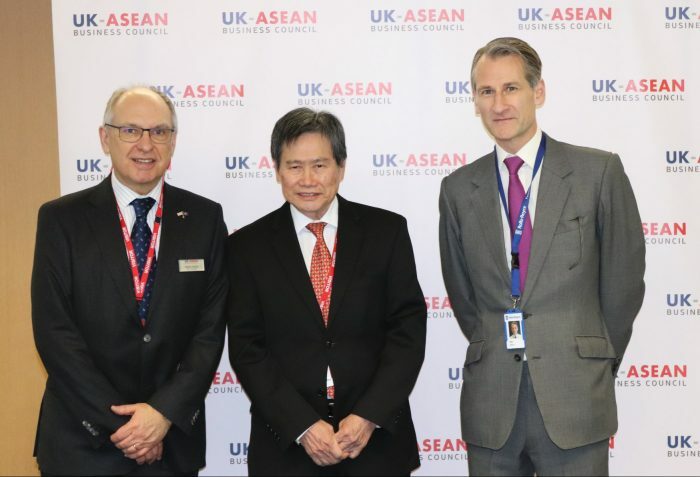 The Secretariat noted the EU-ASEAN Business Council survey findings that said greater openness will help more business investment. The Secretariat is looking at platforms to discuss region to region FTAs. There are bilateral FTAs such as the EU-Singapore FTA but the Secretariat wants to encourage region to region FTAs. It will take a long time but there is an opportunity. ASEAN has just passed the 52nd year mark, what does the Secretary-General hope for the next 50 years? A region that is inclusive, peaceful, sustainable with business growth and better education. 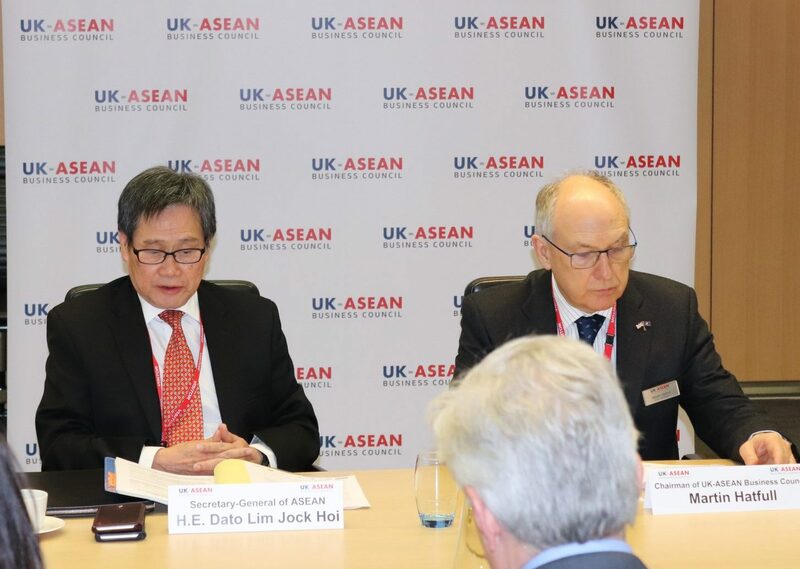 On UK-ASEAN relations, the Secretariat would prefer a UK-ASEAN approach over a bilateral one as everyone can benefit but recognises this takes time. 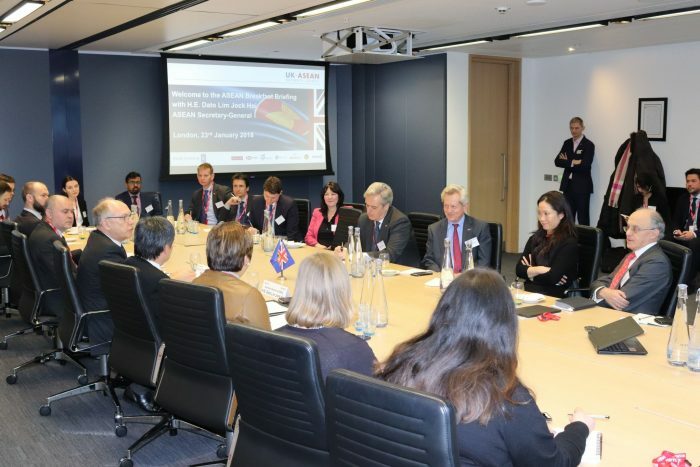 It is only logical that a UK-ASEAN FTA is explored as it is more beneficial for everyone.